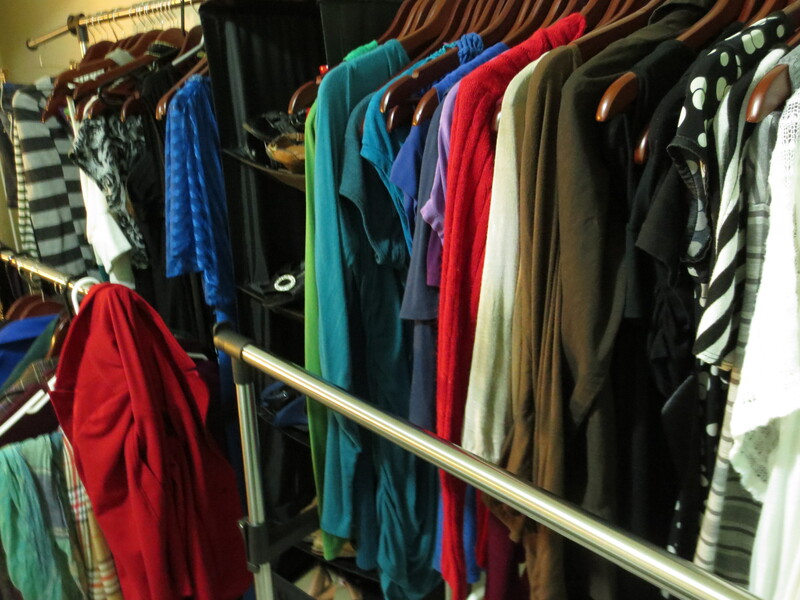 Okay, confession time: Some how, some way, at some point, I wound up owning a LOT of clothes. And shoes. And belts. And earrings, too, though me owning pairs of ANYTHING usually ends with a lot of singletons lying around. This is not something I’m overly proud of, and I certainly do not I know how it happened. I really, really don’t. 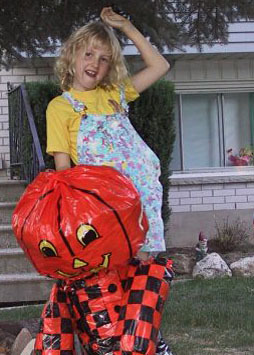 As a kid, I rocked the hand-me-down overalls and uncombed hair with no problem at all, yet somehow wound up being one of those women with the “CUTE SHOES?!?! WHERE?!? !” attitude. 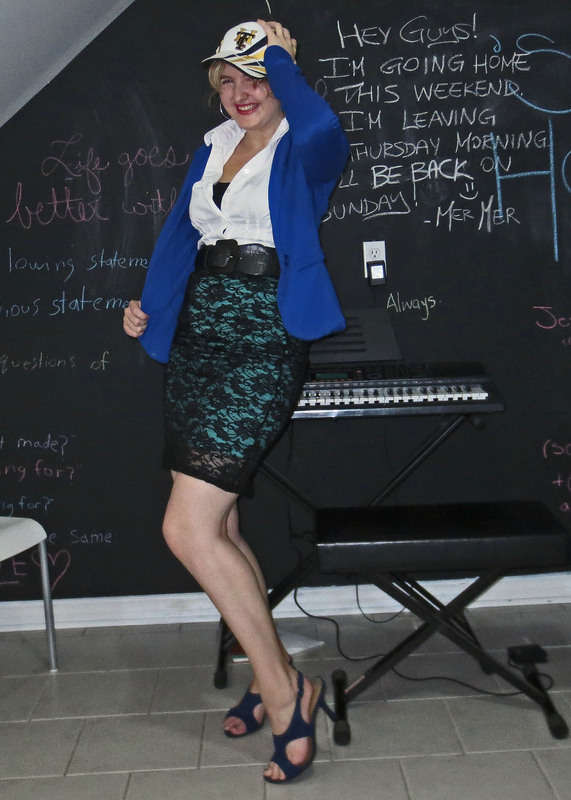 Yeahp, this little lady grew up, and now she doesn’t have enough hangers for all her pencil skirts. Thanks for your influence, society. For what it’s worth, I do try to even out these new fancypants tendencies by regularly pulling my nub of a ponytail through a baseball cap. Like a rebel? Sort of? It’s just a thing. This summer, I took on the project of re-decorating my apartment in a big, big way. My #1 weapon in this undertaking was my friend Josh, a magnificently organized man fresh out of Algonquin College’s interior design program . Pizza in hand, Josh and I discussed some serious apartment overhaul. He helped me through the bathroom, the kitchen, the living area…it was all pretty easy. I knew what I wanted. He knew how to make it better. But then–what of my room? What of my clothes, and my shoes, and my belts? What of the loner costume jewelry findings that I promise, promise, I will transform into something cool someday? Because at the time, I was a student with two jobs and an active social life. My many outfits were, at least in part, complimentary of the many “hats” I wore. My closet was/is my costume collection, and I tend to wear a whole lot of costumes. Because more clothes meant I could go longer without doing laundry. Which is good. I think. Cloffice. Best word ever. I like it. Let’s do that. This was pretty much the response from everyone I told about my new project. “Cloffice! Sweet/neat/cool!! I mean, I think it is. I mean, explain this?” A cloffice, Josh explained, is what happens when a closet and an office make sweet, sweet love (…that is not actually what he said. I am paraphrasing). 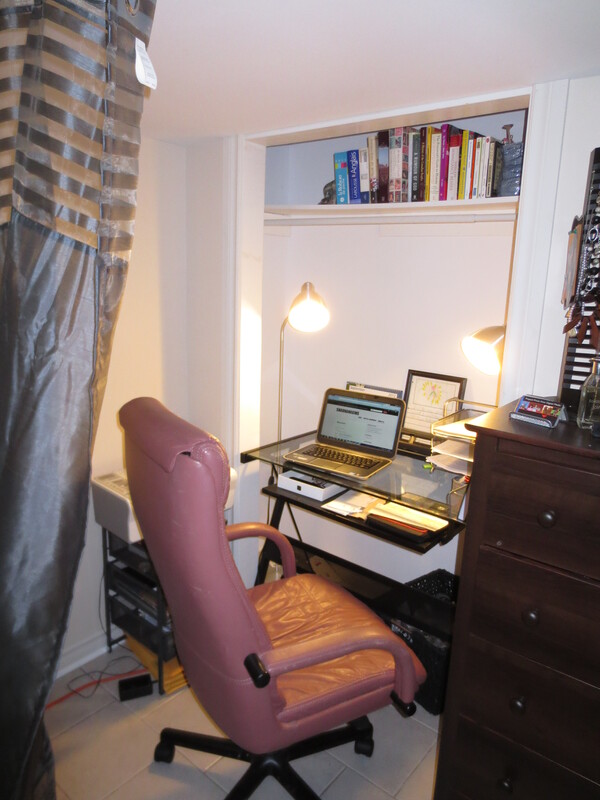 The desk, lamps, books, and other office-y items are placed in the closet, making it a bit of a mini-“room.” This leaves a lot of space in the bedroom for (much needed) clothing racks and shoe organizers. Spoiler alert: There are currently no clothes on my floor. Zero, none. This works. 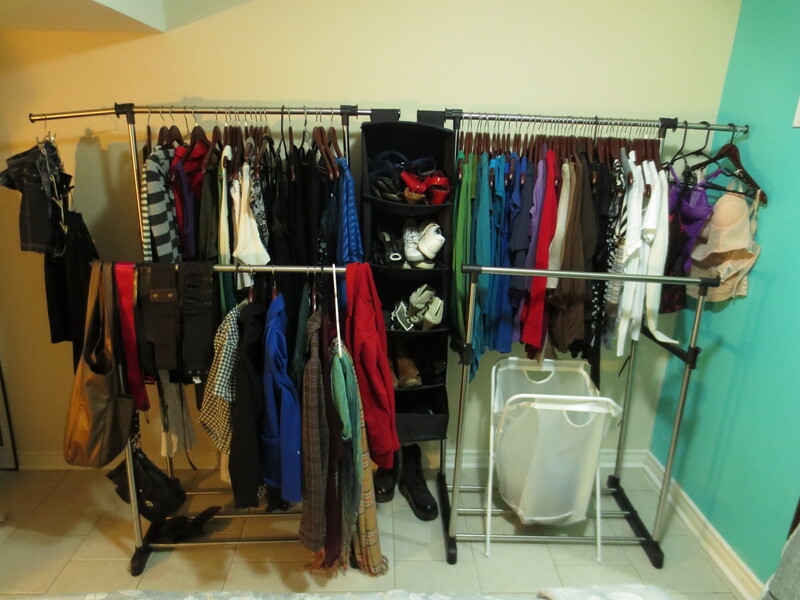 First, I took all of my clothes out of the closet and moved them onto a couple rolling hangers ($30 each at Zellers). In between the hangers, I hung an organizer for (most of) my shoes. My roommate last year had her closet organized by colour. Really good call…makes it much easier to find things. I wanted to separate my cloffice from the rest of my bedroom, especially now that this “bedroom” was really just one big wardrobe with a bed on the side (no complaints). 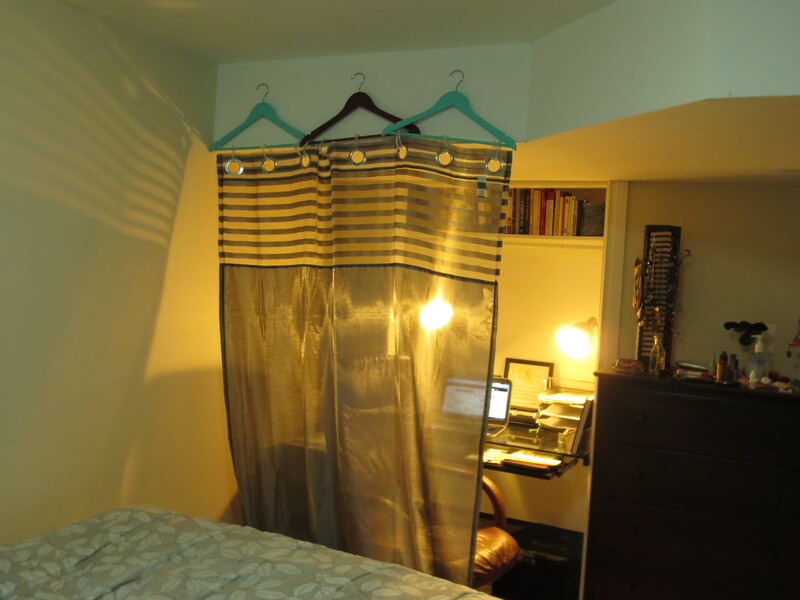 To do this, I simply hung a curtain between the cloffice and the rest of the room. Leftover clothing hangers made for a great impromptu “curtain rod” which paid a little homage to the “clo” side of the cloffice. Using leftover paint, I matched a couple of these hangers to my bedroom’s accent wall to bring some unity to the colour of the room. Finally, it was time for that sweet closet/office lovin’. Aren’t you glad they found each other? My cloffice has now seen me through a good couple weeks of school. Not much has changed since the project began: I still have a lot of clothing. I still don’t know why. I still am not overly proud of it, nor am I willing to change, nor do I need to change it. My solution has been found. Game over. And I think I can speak for myself, my clothing, and my computer in saying: The closet and the office couldn’t be a more perfect union. Previous postPick-Your-Path Lunching (is awesome). Next postThis Country is our Company. I like this “cloffice’ concept. A lot! Only I’d like it to have it’s own room! 🙂 Then I can close the door and not worry about what ends up on the floor!